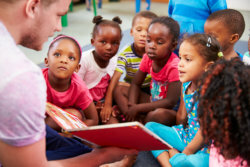 At Honey Bee Palace Child Care Center, we believe in the value and uniqueness of each child we serve. Our childcare experience is designed to promote each child’s own social, emotional, physical, and cognitive development. As caregivers and educators, our mission is to provide a safe and developmentally appropriate learning environment which fosters a child’s natural desire to explore, discover, create, and become a lifelong learner. Honey Bee Palace Child Care Center is a prestige daycare and preschool known to provide quality education to children in Flint, Michigan. We partner with parents to ensure proper growth and development is given to their children. Furthermore, we provide a good platform for the parents to empower them and enhance their parenthood skills for the sake of the future of their child and their family! At our facility, we ensure that we foster each of our student’s physical, intellectual, social and moral development so that they can thrive even in the most stressful environment there is when they grow up. We prepare these students to become stronger and independent in the future to achieve their dreams and become successful. Our academic-rich environment promises that your child will be kept safe and happy while learning with us. If you have questions, please call our hotline number at 810-820-8020 and we will be glad to answer them!